At Emerald Tool, we work with our customers to determine the gage required and provide design concepts from customer part or product assembly drawings. Our focus is to ensure the gage meets your criteria and the standards our customers have come to know us for. We are a complete turn-key supplier of gages large and small, including hand to fully automated gages. 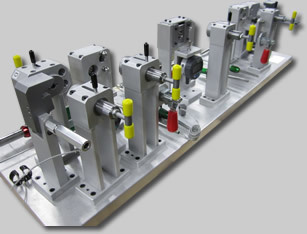 We provide runoff of tooling, CAD files, operation instructions and third party certifications. Our gages have been used in the following industries: Automotive, Military, Furniture, Aerospace, Food & Beverage, Agriculture and Municipalities. We build gages with electronic measuring devices used in probing and vision systems; also gaging for machine fixtures in harsh environments with communication ability to the machine, eliminating human contact/error.